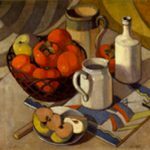 Alison Baily Rehfisch was a Sydney modernist whose work flourished in the years between the wars following a period of male patriarchy in the art world. 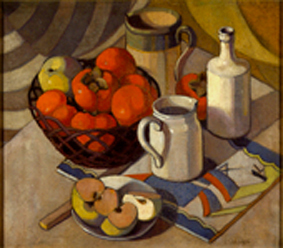 In 1922, she studied with the Italian artist and teacher Dattilo Rubbo whose dedication to disseminating Modernist principles from abroad also appealed to Grace Cossington-Smith, Roland Wakelin and Arthur Murch. In 1933, Rehfisch was bright, young and fashionable. She travelled abroad leaving her daughter Peg in the care of husband Rodney in order to pursue her career. She studied with Iain McNabb at the Grosvenor School in London and then explored Europe with artist George Duncan. 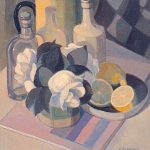 Upon her return to Sydney in 1939, Rehfisch embarked on 36 years of solid painting and exhibiting, always maintaining her allegiance to Modernism through her association with theContemporary Art Society and the Contemporary Group. A monograph by Rachel Power and published by Lou Klepac of The Beagle Press was released in conjunction with the exhibition. Sunday 21 April – Lou Klepac Art publisher and curator discusses the new monograph – Alison Rehfisch : A life for art, with the arts writer Rachel Power. Sunday 28 April – Kevin Power, research coordinator for the publication Alison Rehfisch : A life for art and Jane Watters, Director of S H Ervin Gallery, speak about the work of Alison Rehfisch. Sunday 5 May – Meg Stewart, writer and the daughter of artist Margaret Coen talks about the bohemian art scene in Sydney during the 1930s, and Mike Rubbo, artist and filmmaker, is the grandson of Antonio Dattilo Rubbo, a teacher that introduced a generation of artists to Modernist practice and is also the son of artist Ellen Grey, a close friend of Alison Rehfisch. 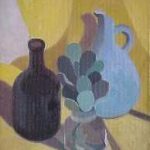 Sunday 19 May – Ria Murch, art historian, shares her memories of Alison Rehfisch and knowledge of the artworld in the 1940s, 50s and 60s.